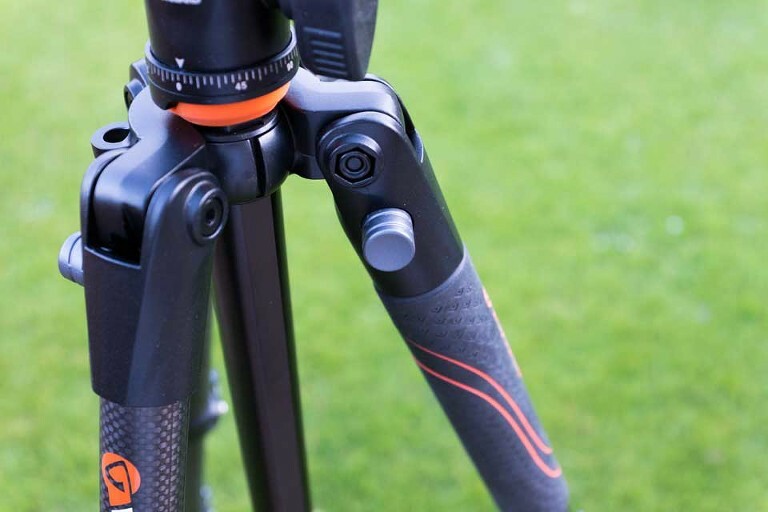 Vanguard invited me to review another tripod, this time from their premium carbon fibre Veo range. In the interest of full disclosure, I have no commercial or financial interest in, or other association with Vanguard and I have received no payment or reward for these reviews. 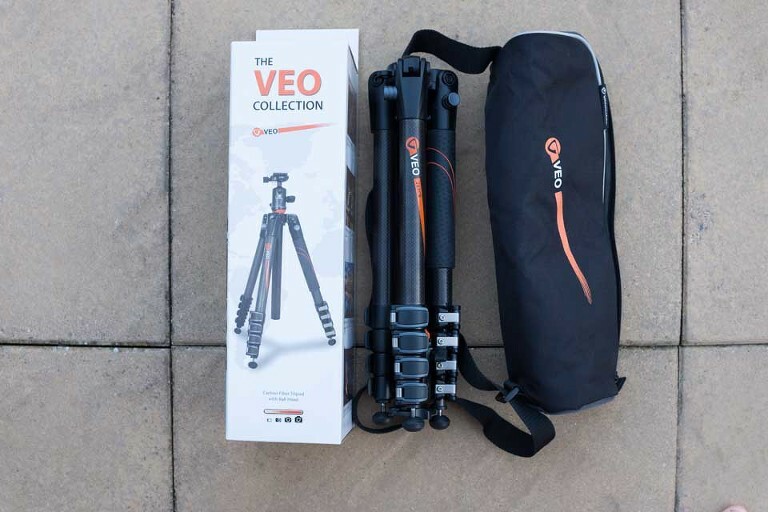 This is a review of the Vanguard Veo 265CB carbon fibre tripod which is a very compact and lightweight travel tripod. It has a rrp of around £249.95 The 265CB has a rotating centre column design which makes it very compact when folded. It comes complete with an Arca Swiss compatible ball head and a very useful padded bag with a shoulder strap. The legs are 5 section carbon fibre with the largest tubes being 26mm diameter and a foam grip to aid carrying fitted to one of the upper sections. The downside of having to adjust 4 flip lock levers per leg is that it can take slightly longer to set the tripod up. In reality, this point is often over stated on photography forums. The time it takes to fiddle with a few more levers can really be measured in seconds rather than minutes and the benefit of an extremely compact folded tripod negates the criticism further. One criticism that may be justified is that those extra fittings do add weight to the tripod. The manufacturer quotes a folded length of 390mm which is commendably compact and the weight is around 1.5kg. It is slightly shorter when folded, but about half as heavy again as my Gitzo 1550T . If counting grammes is important, then close comparison with other manufacturer’s offerings will be required. For most purposes that additional 500g isn’t a major issue, but it is noticeable when you have something which is lighter to hand for comparison. That said, it’s worth bearing in mind that losing that half kilo could well cost at least a couple of hundred post-Brexit GB pounds more for an alternative manufacturer’s offerings (eg Gitzo), which may not include an Arca-Swiss type ball head. The flip lock adjusters are robust and allow for tightness adjustment and on the review sample the tightness of the locking mechanism was optimum straight out of the box. I did not experience any slippage or the kind of ‘leg creep’ that is the bane of my old alloy Manfrotto 190XB studio tripod. After several months of regular use and literally hundreds of extending and collapsing cycles, the flip lock adjusters are still as firm as the day I unpacked the tripod. This is a telling comparison with my Manfrotto 190XB which needs constant and annoying re-tightening. The overall construction and design of the 265CB is excellent. All of the component parts are accurately machined and fit perfectly together. The key to the structural integrity of this type of tripod design is with the leg and centre column attachment. There is a substantial ‘U’ shaped cast alloy collar which the legs are attached to and which the centre column goes through. The collar is quite deep and does add to the overall weight of the tripod but I can see that it would need to be robust to cope with torsional stresses when the centre column is rotated downwards for packing or the legs are splayed outwards for low-level shooting. If this casting were to fail, it would be impossible to lock the centre column height and the heavy duty appearance of the collar casting is clearly designed for long-term use and to prevent failure. The image below illustrates the method behind the compact folded size of the Veo 265CB. There is a spring-loaded pin in the centre column, the kind you find in steel tent poles, which when pressed in allows you to pull the centre column up through the cast alloy collar and then swing the column down so that it rests between the three legs when folded. It’s a simple and effective solution. The image below shows the centre column in the folded position and there is a plastic shock-absorbing bumper under the head. The included Arca-Swiss compatible ball head is well made and has a bubble level set into it. If your camera does not have a level horizon display or you don’t have an accessory level attached to your camera, then the built-in bubble level will be quite useful for initial setting up. The ball head also has a lockable panning base which is a useful addition for stitching image files later. The ball head locks firmly in position and I have not experienced any tendency for my Nikon D810 and 24 or 85mm f1.4G lenses to droop, even when left for long periods. The legs each have a spring loaded locking button to adjust for very low level shooting. As with all tripods that have a centre column, the camera height from the ground will be dictated by the centre column. Vanguard have thought about this and a short centre column is provided to replace the standard column for very low level work. One leg has a foam rubber grip at the top to aid handling, a welcome feature over less well designed tripods. 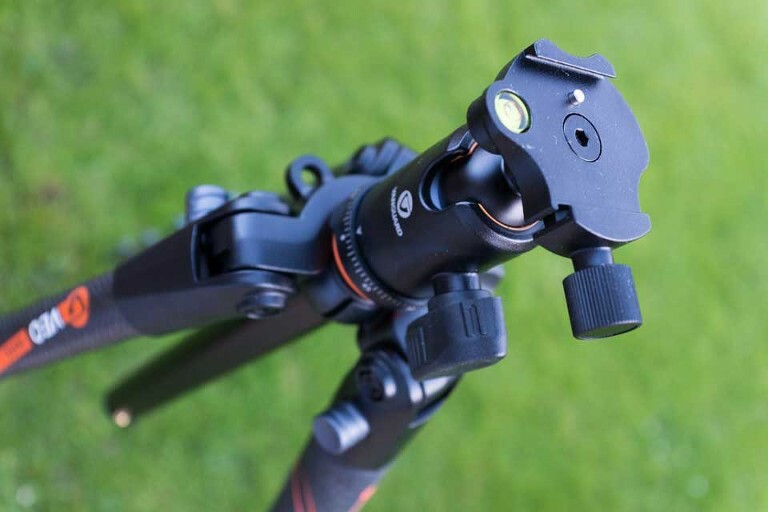 With five sections and individual locking buttons for splaying the tripod legs, there is unlimited height and angle adjustment. The camera and lens combined weight limit is quoted as 8kg, far more than my Nikon D810 and Nikon 20mm f1.8G lens. The maximum height of the tripod is given at a fraction under 5 feet. This is with the centre column extended to it’s maximum height. I would not normally extend the centre column at all, with exposures of several minutes in calm conditions I did not experience any blurred images due to movement during exposure. The Arca-Swiss type ball head is good quality with no binding or slippage when locked down in portrait format. The heaviest camera and lenses I used on the Veo 265CB were the Hasselblad 503cw with 50mm distagon Cfi, Nikon D810 with Nikon 85mm f1.4G and Nikon 24mm f1.4G and a Fuji GSW690iii. These combinations are well within Vanguard’s quoted maximum load limit of up to 8kg. The small folded size and light weight is a real bonus during a full day on the hill. The rubber feet screw in to reveal metal spikes. This is one area where I found a couple of potential issues: 1. the leg tubes are not sealed and water will enter the tubes, and 2. the threads on the spikes can also become clogged with sand and grit, making adjustment difficult. Regular care and maintenance with these points will be required. On uneven ground, having four flip locks on each leg makes fine adjustment quite easy and the extended tripod is stable enough for long exposures. Overall, the Vanguard Veo 265CB represents good value in the competitive middle ground. It performs well and does what it’s supposed to do within is range of camera and lens weights. Very compact when folded for carrying. It will easily fit inside most aircraft cabin baggage. Robust with good quality materials and workmanship. Arca-Swiss compatible panning ball head included. Accessory short column for low-level work. Padded bag with shoulder strap. Rubber feet with concealed spikes. 26mm carbon fibre tube legs. Price (£249.95). Reasonable cost for a versatile fully-featured carbon fibre tripod. Weight (compared to my much more expensive Gitzo 1550T). Foot spike threads may not be corrosion resistant. Although it has a maximum load rating of 8kg, my personal opinion is that this is not a sensible weight for a tripod of this type to support. That isn’t to say the tripod will not take it, it certainly will, but if I were using such a heavy camera and lens around 8kg in weight, I would not want to be risking camera shake. However, I have used a Nikon D810, Fuji GSW690iii and a Hasselblad 503CW on the 265CB without any problems, even with exposures of several minutes. For me, the Vanguard 265CB really comes into it’s own when it is paired with smaller cameras. My Fuji X100T, Nikon FE and Leica MP all make a good compact options for destination and travel photography. The 265CB matches all of them well and is where this tripod will perform at it’s best If you are a frequent traveler or hiker looking for a good quality, reasonably lightweight and compact tripod, the Vanguard Veo 265CB is definitely worth a close look. Vanguard’s quality of materials and manufacture are very high, the features are innovative and the price is attractive. Some long exposures with a Fuji X100T mounted on the Vanguard Veo 265CB carbon fibre tripod. Tichwell beach at low tide, North Norfolk. Clearing rainstorm and Ben Bulben from Rosses Point, Co. Sligo, Ireland. I have used the Vanguard Veo 265CB carbon fibre tripod to photograph a wedding in Ireland and I have used it extensively on my Wild Light photography workshops in Kerry & Dingle, the Outer Hebrides, the Faroe Islands, Cornwall and the Yorkshire coast and moors. It’s also been with me on numerous day walks in the Peak District, Lake District and Yorkshire Dales. It has been out in all weathers and has stood in salt water for prolonged periods during long exposures. The only visible effect of it’s travels is a little corrosion in the threads of the adjustable foot spikes. On the face of it they appear to be made of stainless steel, I’m no metalurgist but I think the spikes and threads may only be plated. If superficial plating is the case, the spikes will corrode without regular cleaning and maintenance. It might be worth coating them with an anti corrosion treatment if you are going to be standing the tripod in salt water and it is advisable to dismantle and rinse the legs inside and out and then dry them thoroughly before reassembly after immersion. Otherwise, I have no complaints about the 265CB. At this price point I think it makes a good option to consider if you are looking for a compact and lightweight carbon tripod to take on your travels. What is the height of the tripod without the centre column extended? I can’t find this info anywhere. 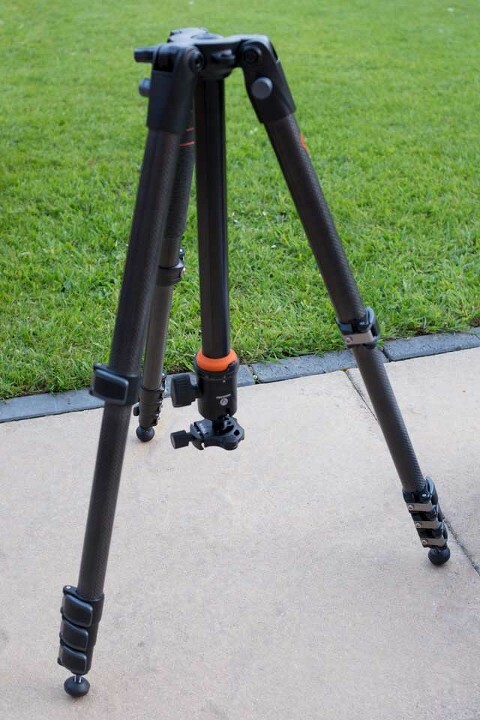 How does this tripod compare with the Manfrotto Befree Carbon Tripod which is similar spec and price? The thickest part of the legs are 26mm diameter. What is diameter of the thinnest part (the lowest part)?